You keep hearing about podcasts—from friends, online, even on TV. But what are podcasts, and how do you get started listening to them? Don’t be embarrassed to ask: podcasts are one of the least accessible forms of online media. Anyone can click a link to a YouTube video, and even people without a Twitter account can scroll through threads on Twitter. Links to podcasts, however, tend to be links to website or iTunes pages where you can’t listen. So what’s going on here, and how can a non-geek start listening to these shows? Here’s everything you need to know. A podcast is a radio show on the Internet. It’s that simple. Okay, there are a few differences. Podcast aren’t generally broadcast live—they’re recorded, meaning you can listen whenever you want. Most podcasts release new episodes once a week, but some offer episodes daily—it varies wildly. Many podcasts are episodes of shows you could also hear on the radio, with all the production values you’d expect. Others are just a group of friends sitting around a microphone, or using Skype, talking about a subject they’re passionate about. A lot of popular podcasts are somewhere in the middle: conversational at times, structured at others. It’s an entire world, really. For me, it’s the perfect companion for cleaning the house or cooking a meal, and many use podcasts to make long commutes more interesting. What Do I Need To Listen To Podcasts? Basically, all you need is a piece of software you can use to subscribe to shows. Most people listen to podcast on mobile devices, because part of the point is listening on the go. You don’t actually need to install anything. Every iPhone comes with a Podcast app by default, and opening that is a great way to get started with podcasts. 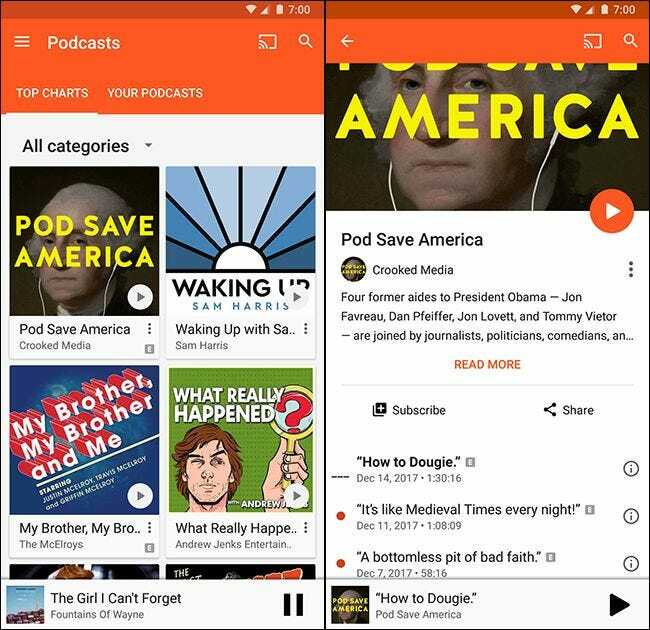 Android users can listen to podcasts using Google Play Music . Open either app and start browsing. Some people prefer third party applications for listening to podcasts—I like Player FM on Android, for example. Overcast is a great, free podcast app for iOS. And there are lots of other choices, some free, some paid. But you don’t be overwhelmed by all the choices. Start with the apps already on your device. If you get into listening to podcasts, you’ll start to notice the features you wish those apps had, and them you’ll have a better idea of what you want in a third-party app. Also note that podcasts aren’t just for phones. You can listen to podcasts using your Amazon Echo, for example: it just takes a little setting up. And there are desktop options as well. There’s iTunes, which offers an extensive podcast catalogue for macOS and Windows users. If you’d prefer something open source there’s GPodder, which works on Linux, macOS, and Windows. You’ve got options, but don’t let that overwhelm you. Just open whichever app you have on hand and start exploring. How Can I Find Podcasts I’ll Enjoy? Most people get into podcasts because a specific person whose work they enjoy announced that they’re starting one. If that’s you, simply search your podcast app of choice for that show. Generally, these shows recommend other shows, which will help point you toward things you might enjoy. Subscribe to things you like, and don’t feel guilty about unsubscribing things later. There are only so many hours in a week, after all, and with so many shows to choose from there’s no reason to spend time listening to something you don’t enjoy. What Are The Objectively Best Podcasts on Earth? I’m glad you asked! Have a seat; I’ve got opinions. My current favorite podcast is Reply All, which is a delightful weekly look at all sorts of weird corners of the Internet. A recent episode featured a host trying to get to know a tech support scammer over the phone, and then actually traveling to India to meet that scammer in person. But sometimes, that host just tortures their boss by asking if he understands esoteric Twitter nonsense. It’s wonderful you guys, check it out. The most boring recommendation I could possibly make is This American Life, because everyone recommends that show. But there’s a reason for that: it’s not really boring at all. Rather, it’s consistently one of the most engaging hours you can listen to, regardless of what subject they take on. As a huge media nerd, I can’t go a week without listening to On The Media, an essential podcast for anyone trying to make sense of our age of information overload. Every episode makes me question some narrative the media is pushing, which is a useful impulse to have in 2018. I’m not just a media nerd: I’m a hockey fan. That’s why, for me, 31 Thoughts is can’t miss. It’s Elliot Friedman from Sportsnet talking shop with Jeff Marek, and if you’re not Canadian I just lost your attention but whatever this podcast is excellent and every hockey fan should give it a shot. If you like discovering new music, I cannot recommend NPR’s All Songs Considered enough. The hosts are knowledgeable about music, and I usually discover something I love. The kinds of music featured are wildly divergent, which is honestly part of the fun. I’ve just now realized that I haven’t mentioned 99 Percent Invisible, The Bugle, and Heavyweight, all of which I could praise here endlessly. But I’ll just stop, and let you know that the above shows are objectively the best podcasts on earth. And if you’re a gamer, you’ll find all kinds of podcasts that cover gaming in general, as well as podcasts devoted to specific games. Your list will vary, of course, and that’s part of what makes podcasts so wonderful. You can’t help but find something you love and want to keep listening to.